Frozen Shoulder Exercises aim to reduce pain, increase extensibility of the capsule, and improve strength of the rotator cuff muscles. iii) Specific shoulder exercises to offer graduated stretching. Though prior heating of the joint has been found to facilitate relaxation and mobilization, one may use the heat modality suitable to the patient's response. However ultrasound, beside deep heating, has the added advantages of increasing excitability of the contracted soft tissue and is therefore performed. The patient is placed in supine position with the affected shoulder in maximum possible abduction and neutral rotation and elbow in 90 degree of flexion. The physiotherapist grasping the arm above the shoulder joint carries out relaxed passive gliding movement of head of humerus on glenoid. Axial traction and approximation is carried out along with antero-posterior glide and abduction- adduction glide. To induce relaxation, always begin with slow rhythmic movement. Slow and rhythmic circumduction at the glenohumeral joint, in forward stoop position effectively induces relaxation and promotes mobility. Gentle relaxed passive movements reduces pain and pathologic limits of motion. The reduction in pain occurs because of the neuro-modulation effect on the mechanoreceptors with in the joint. Mobilization by accessory movements of acromio-clavicular, sterno-clavicular and/or scapulo-thoracic joint articulation is also extremely helpful. Frozen shoulder exercises plays an important role in management of the condition. While planning the frozen shoulder exercises one must give due importance to the fact that contracted soft tissue when objected to repeated prolong mild tension show extensibility and plastic elongation. An increase in the movement following the session of prolonged stretching was usually associated with a corresponding increase in the other movements too. However improvement in the range of other movements is not always at the same rate. Shoulder elevation with flexion, abduction and external rotation. Shoulder internal rotation with extension, adduction and elbow flexion i.e attaining "hand to lumbar position". By weight and pully- Tolerable weight must be used. This may be done in supine or sitting position. By self assisted stretching- Method of performing is, the patient uses his normal or contralateral arm for gradually stretching the affected shoulder. For this, manipulation and mobilising techniques are given by"MAITLAND". By this patient respond very well for acquiring full range by properly guided simple and specific Frozen shoulder exercises which ensures relaxed graduated stretching of the contracted capsule. The importance or necessity of regular stretching must be explained to the patient even after he had recovered from stiffness and pain to avoid the recurrence of periarthritis or stiffness. Patient having diabetes responds very slow to the treatment and also feel much more pain as compared to those who are non-diabetic. Patient who are complaining of pain in the night (nocturnal pain) should be treated by heat therapy or thermo therapy. The contralateral or normal shoulder should always be examined and given regular stretching exercise programme as a precautionary measure to maintain its functional capacity. Codman introduced the term "frozen shoulder" in 1934 to describe patients who had a painful loss of shoulder motion with normal radiographic studies. In 1946, Neviasernamed the condition "adhesive capsulitis" based on the radiographic appearance with arthrography, which suggested "adhesion" of the capsule of th GH joint limiting overall joint space volume. Patients with adhesive capsulitis have a painful restriction of both active and passive GH joint motion in all planes, or a global loss of GH joint motion. The condition is common in people of 40-60 years age group, with a higher incidence in females. The onset of an idiopathic frozen shoulder has been associated with extended immobilization, relatively mild trauma, and surgical trauma, especially breast and chest wall procedures. Adhesive capsulitis is associated with medical conditions such as diabetes, hyperthyroidism, ischemic heart disease, inflammatory arthritis and cervical spondylosis. Most significant association is with Insulin dependent diabetes. Length of each stage is variable, but typically the first stage lasts for 3-6 months, the second stage from 3-18 months, and the final stage from 3-6 months. 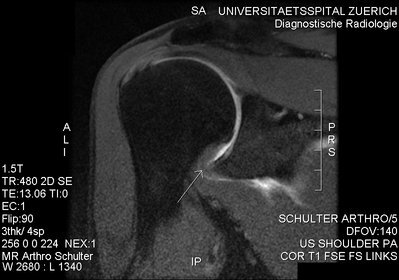 The first stage is the freezing phase, characterized by onset of an aching pain in the shoulder. The pain is usually more severe at night and with activities, and may be associated with a sense of discomfort that radiates down the arm. Often, a specific traumatic event is difficult for the patient to recall. As symptoms progress, there are fewer arm positions that are comfortable. Most patients will position the arm in adduction and internal rotation. This position represents the "neutral isometric position of relaxed tension for the inflamed glenohumeral capsule, biceps, and rotator cuff." The second stage is the progressive stiffness or frozen phase. Pain at rest usually diminishes during this stage, leaving the patient with a shoulder that has restricted motion in all planes Activities of daily become severely restricted. When performing activities, a sharp acute discomfort can occur as the patient reaches the restraint of the tight capsule. Pain at night is a common complaint and is not easily treated with medications or physical modalities. The stage can last from 3-18 months. The final stage is the resolution or thawing phase. This stage is characterized by a slow recovery of motion. Aggressive treatment with physical therapy frozen shoulder exercises, closed manipulation or surgical release may accelerate recovery, moving the patient from the frozen stage into the thawing phase. Not every stiff or painful shoulder is a frozen shoulder, and indeed there is some controversy over the criteria for diagnosing "frozen shoulder". Stiffness occurs in a variety of conditions- arthritic, rheumatic, post-traumatic, and post operative. The diagnosis of frozen shoulder is clinical resting on two characteristic features. a natural progression through three successive phases. When the patient is seen first, a number of conditions should be excluded: infection, post traumatic stiffness, diffuse stiffness and reflex sympathetic dystrophy. In general, a global loss of active and passive motion is present; the loss of external rotation with the arm at the patient's side is a hallmark of this condition. The loss of passive external rotation is the single most important finding on physical examination that helps to differentiate the diagnosis from a rotator cuff problem because problems of the rotator cuff generally do not result in a loss of passive external rotation. Even though adhesive capsulitis is believed to be a "self limiting" process, it can be severely disabling for months to years and, as a result, requires aggressive treatment once the diagnosis is made. Initial treatment should include an aggressive frozen shoulder exercises to help regain shoulder motion. For patients in the initial painful or freezing phase, pain relief may be obtained with a course of anti-inflammatory medications, the judicious use of GH joint corticosteroid injections, or therapeutic modality treatments. Intra-articular corticosteroid injections help to abort the abnormal inflammatory process often associated with this condition. Operative intervention is indicated in patients who show no improvement after a three month course of aggressive management that includes medications, corticosteroid injection and physical therapy. Oral steroid taper- for patients with refractive or symptomatic frozen shoulder. Apply moist heat before therapy and ice pack at the end of session. Initially focus on forward flexion and internal and external rotation with the arm at the side, and the elbow at 90 degrees. In home these Frozen Shoulder Exercises should be performed 3-5 times per day. A sustained stretch, of 15-30 seconds, at the end ROMs should be part of all ROM routines. Pain Control by same means as used in 1st 8 weeks. Perform active, active assisted and passive range of motion exercises to obtain around 140 degree of forward flexion, 45 degree of external rotation and internal rotation to twelfth thoracic spinous process. Start with rotator cuff strengthening exercises 3 times per week, 8-12 repetitions for three sets. Closed chain isometric strengthening with the elbow flexed to 90 degrees and the arm at the side. Perform internal rotation, external rotation, abduction and forward flexion. Progress to open chain strengthening exercises with theraband for same greoup of muscles. Progress to light weight dumbbell exercises for internal rotators, external rotators, abductors and forward flexors. Perform strengthening of scapular stabilizers. Significant functional recovery of shoulder motion. Successful participation in activities of daily living. Home maintenance frozen shoulder exercises. ROM exercises 2 times a day. Rotator cuff strengthening 3 times a week. Scapular stabilizer strengthening 3 times a week. Please check with your Physical Therapist before starting with this frozen shoulder exercises. Maund E, Craig D, Suekarran S. Management of frozen shoulder: a systematic review and cost-effectiveness analysis. Health Technol Assess. 2012;16(11):1-264. Page MJ, Green S, Kramer S. Manual therapy and exercise for adhesive capsulitis (frozen shoulder). Cochrane Database Syst Rev. 2014 Aug 26;8:CD011275.